John Paul Strain Hand Signed and Numbered Limited Edition:"Alabama Corps of Cadets Call to Battle"
Size: 25 1/4" x 19 1/2" - Additional sizes and mediums will be listed for selection from the Drop down box. Medium: Lithograph on Paper with Giclee Canvas Editions - Select available options from drop down box. 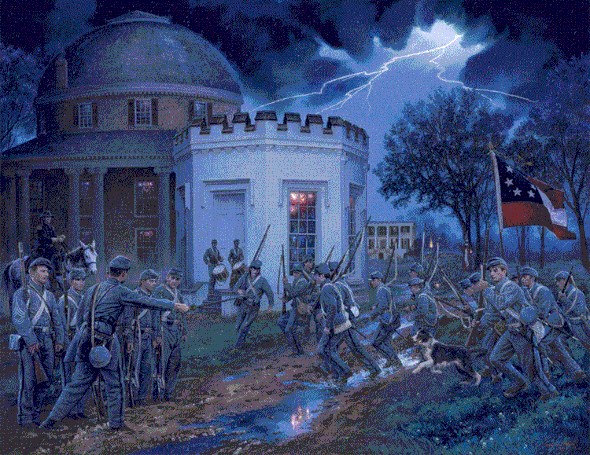 About the Art: It was the twilight of the Confederacy in the spring of 1865. Federal armies were tramping throughout the southern states, burning, pillaging, and destroying anything of value, with little resistance from the remnants of the Confederate army. In late March of 1865 Union General John T. Croxton was given orders to take his cavalry force of 1500 troopers to Tuscaloosa and "destroy the bridge, factories, mills, university, and whatever else may be of benefit to the rebel cause." Three hundred young men from the Alabama Corps of Cadets ranging in ages from 15 to 20 years old were all that stood before the invading force.